Includes purchasing a domain name, hosting for one year and 3 pages with stock photography. An example can be found here. Includes purchasing a domain name, hosting for one year and up to 5 pages with stock photography and a custom logo. Mobile ready. Includes purchasing a domain name, hosting for one year and up to 5 pages with stock photography, 3 custom photos taken by us, and a custom logo. Mobile ready. Includes purchasing a domain name, hosting for one year and up to 7 pages. 3 custom photos taken by us, stock photography, custom logo, placement on a google map and basic initial SEO. Includes purchasing a domain name, hosting for one year and up to 7 pages. Installation of a shopping cart. 3 custom photos taken by us, stock photography, custom logo, placement on a google map and basic initial SEO. Includes purchasing a domain name, hosting for one year and up to 7 pages. Installation of a shopping cart and adding up to 50 products. Installation of a payment gateway. 10 custom photos taken by us, stock photography, custom logo, placement on a google map and basic initial SEO. We are not finished until you are selling products online! All of our websites are mobile ready. 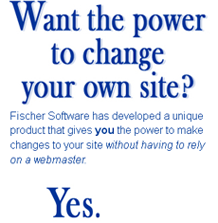 Fischer Software can make just about any part of any website easy to update by the end user. Whatever you need to update can be made easy for you to update! No web developer needed. We can upgrade any existing website to be modern and professional. We can make any website updateable by the end user. We are available to do troubleshooting and routine maintenance.